This cup and cover with removable spice-box bears the arms of both King James I and the Prince of Wales, the future Charles I. A number of similar cups are known to exist; this cup is one of four in the collection of the V&A. 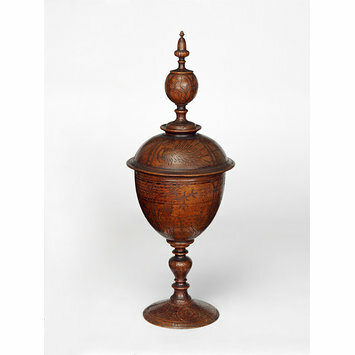 Most are made from turned pearwood, incised with heraldic animals, and date from the early 17th century. The closeness in design of the majority of these cups, and of their date of production, may suggest that they came from a single workshop, or were the work of a single craftsperson. It is not certain exactly what this type of cup would have been used for. The most regular interpretation is that they were communion cups used by private chapels, or by chapels that could not afford silver. However, the use of wood as a material for holding the host had been forbidden by the Canons of Winchester since around 1071, as its porous nature would cause the wine to be absorbed. Other theories concerning their use range from the humdrum (being prototypes for silver communion cups) to the glamorous (the insignia of an exclusive society). The latter notion holds some weight, it has been suggested that the armorials are the crests of founding members of such a society. Standing cup and cover with spice box. Turned pearwod, engraved with the arms of Great Britain and Ireland, the coronet of the Prince of Wales, heraldic birds and animals, quotations from Scripture, and poetry relating to the subject of the Eucharist. On the stem there are carnations, and on the upper side of the foot roses. 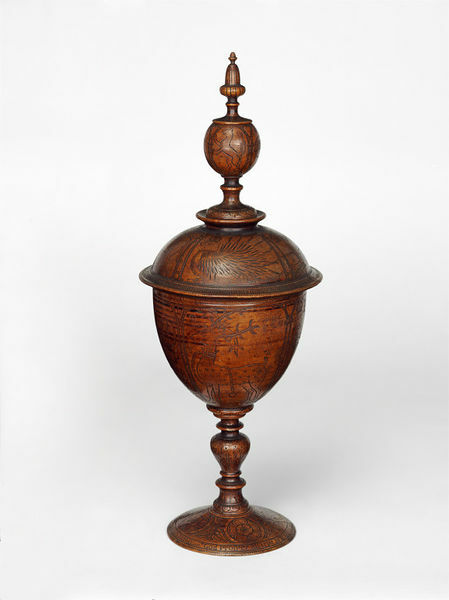 The globular spice box attaches to the cover using a hit-and-miss closure, and the acorn-shaped finial in turn screws into the top of the spice box. 1) the arms of England surrounded by a garter and the motto, and supported by a lion and a unicorn. 3) the Prince of Wales' feathers issuing from a crown. Motto of the Prince of Wales; a contraction of the German term. Found here over the Prince of Wales feathers. Below the royal arms of England. Underside of foot, in five concentric borders. Inscription may have been continued on another cup of the pair. Given to the Museum in 1872 by Rev. G. Townshend Hudson. Pinto proposed that they may have been 'part of the insignia of some exclusive 17th century society', similar to, or perhaps an ancestor to, the Honorable Order of Little Bedlam, a social club founded by the 5th Earl of Exeter in 1684. This cup is decorated with various animal crests, possibly those of founder members of an exclusive society. They include the elephant of the Knollys family, Earls of Banbury, and the mythical wyvern of the Herbert family, Earls of Pembroke, here shown with a hand in its mouth. The exact purpose of this cup is not known.